Lindsay and Margaret from Woodward PDA have been very busy ladies. Keep sending in what you make we love to see our products being used. 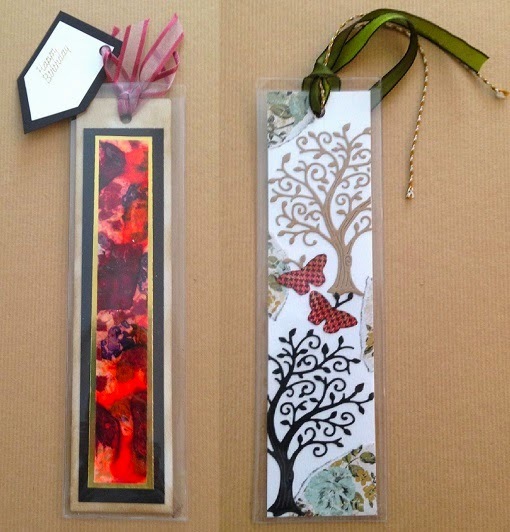 The Red Bookmark was crafted by Margaret and the Spring Bookmark by Lindsay. Both fantastic and both talented ladies. Well that was definitely a mega weekend at The Craft Barn. Went from flash floods in the marquee on Saturday to how many layers Michelle could strip down to and still look decent on what felt like the hottest day of the year on Sunday. However The Craft Barn these events so well everything was under control. Below are a couple of projects Michelle was working on over the weekend using Stix2 Layer Perfect, Hot Melt Glue Gun, Seed Bead and Glitter along side many others on the first. On the second the Stix2 products Michelle used are the Tape Runner, Diecut Large Alteration Tag and again the Layer Perfect. Alternitavely you can view our products or other Stix2 events on our website here. Ready to start at the CHA-UK One Big Show! We are here to show our new products to the industry while also to share our business knowledge and crafting tricks while hopefully being about to pick some up ourselves. Michelle is hosting a work shop at 11.20am and 4.20pm today using the Layer Perfect and other Stix2 products. For more information on the CHA-UK One Big Show happening today and tomorrow please click here. This weekend we have 4 fantastic in shop Stix2 demo days all ready for your entertainment. 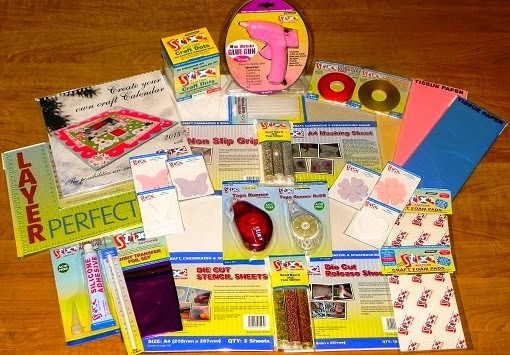 Aldridge Crafts in Attleborough, Annette will be with Jane and her team again showing different ways to be using the Hotmelt Glue Gun, Its not just for sticking! Weavervale Garden Centre craft shop, have Karen joining them sharing her ideas for the 2015 Calendar, a great idea for the new year. 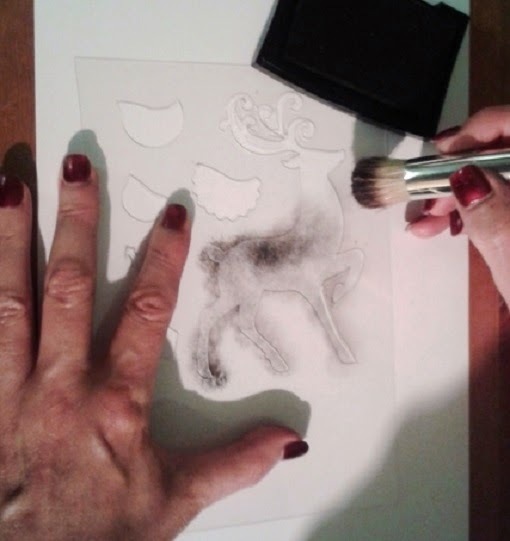 QuickDraw Crafts in Totten, Southampton, Jayne will be there with Laura and the team showing how to use the Diecut Stencil Sheets with other Stix2 products. Cardwell Nurseries craft shop in Gourock, have Emma popping over for the day, to show Pauline & her team for the Craft Fair happening all weekend. Emma will be sharing some of her handy tips and tricks using her favorite Stix2 Products. Lots going on this coming Saturday, so we hope to see you there. 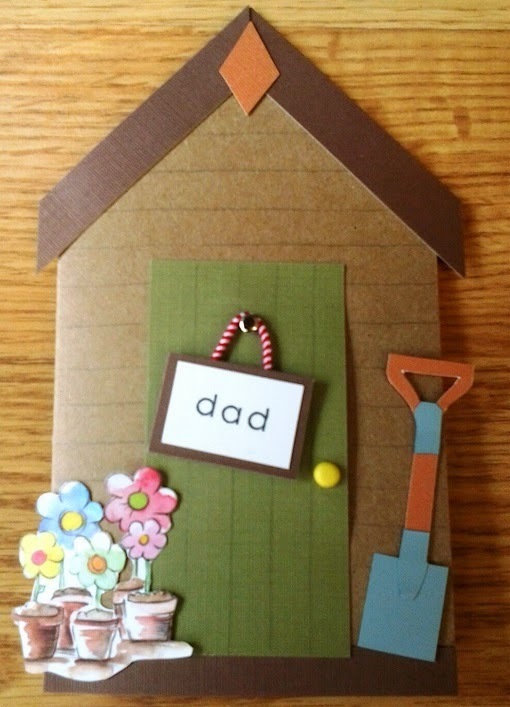 For her fantastic Garden shed card. We loved how the shape was different and used the Double Sided Tape for the roof, Foam Pads for her sign and Glue Dots for the spade and flowers. We hope your Father In-law loved his card as much as we did. Congratulation Anne! Your parcel is on its way! or Post your entry to the address given here. Don't forget to let us know what Stix2 Products you have used and include as many others as you like! We can't wait to see what you are crafting and look at all of your amazing ideas. There is no restrictions on other products you wish to use, so feel free to go wild! The winner will be announced on 16th June 2014! Good luck and as always: Have Fun Crafting! Last Day to get your entry in to WIN the bundle! Final Day before we announce the WINNER Tomorrow! 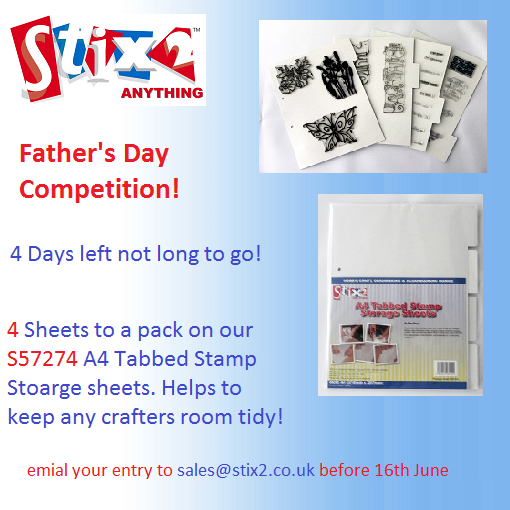 Email, Tweet or Facebook us a picture of your father's Day Card! 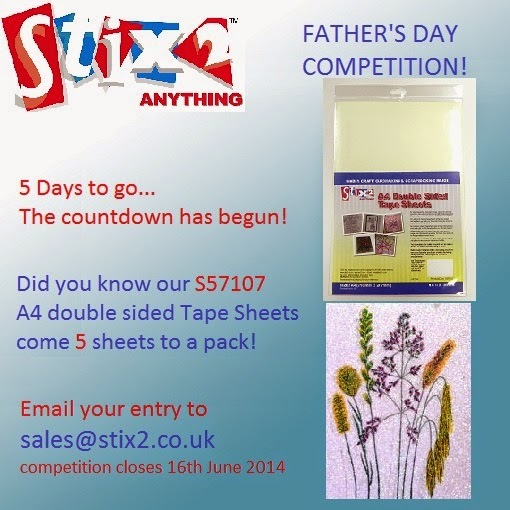 ...only 2 days remain to be in with a chance to WIN £80.00 of Stix2 Goodies! 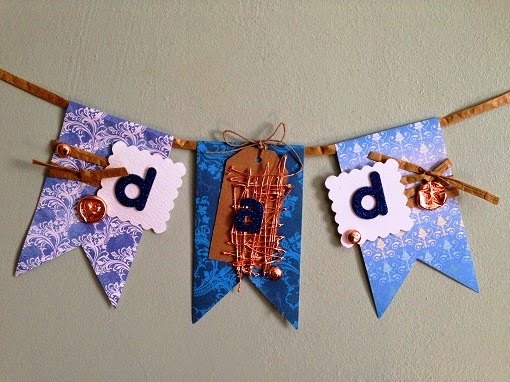 Too late to Post so email, Tweet or Facebook us a picture of your Father's Day Card! 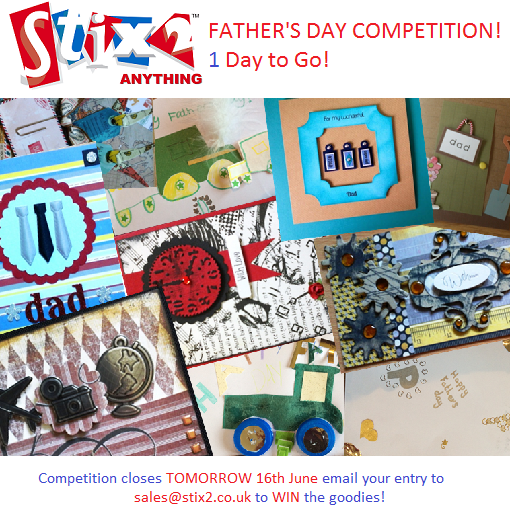 Email, Facebook, Tweet or Post your Entry to us before we choose a WINNER on 16th June! 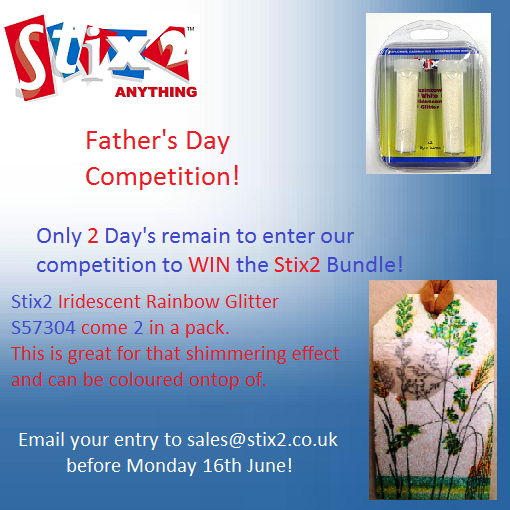 Continuing the countdown to WIN the Stix2 Bundle of £80.00 Goodies! Email , Facebook or Tweet us a picture of your card or send it in by Post! Not much time left. Competition closes and winner announced 16th June. The count down has begun to the end of our competition! Competition winner announced 16th June! The day after Father's Day! For Competition Details please click here. Start by cutting the pennants, I used 3 different patterned papers from the 6" x 6" paper stack pad. Cut in half using the Layer Perfect line up on the 3” mark and cut down with a craft knife.If you do not feel confident with a craft knife draw a pencil line and cut with scissors. Next use your Layer Pefrect to cut the triangle from the bottom end of the strip of paper, ensuring that the layer perfect is the same measurement on each side at the 2" mark. Then fold down the top of the pennant 1/2“, this will be the flap to thread through the raffia to string up the bunting. 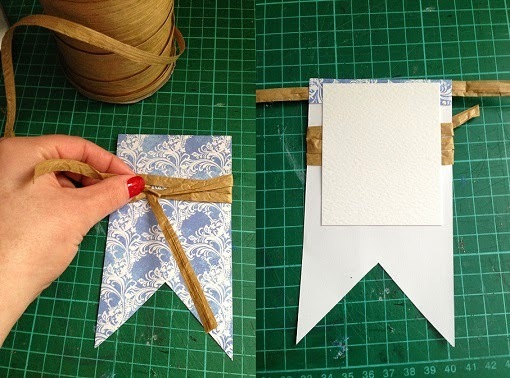 Decorate two of the pennants by wrapping raffia around, securing with a knot. Then to strengthen the pennant and also to secure the raffia and the flap cut the top off the Diecut Large White Alteration tag to create a large sqaure and secure to the back with double sided tape. 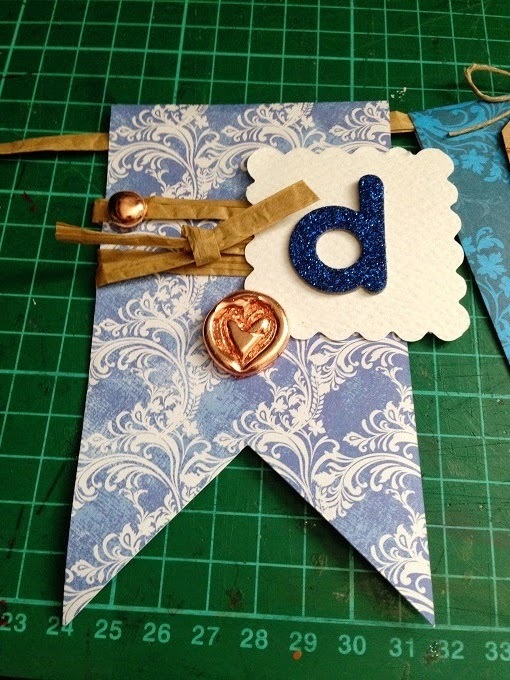 Then attach the scalloped square die cuts with silicon glue. To add dimension, decorate with hot glue embellishments. (See below for information on how to make embellishments.) Also not forgetting the glitter letter. 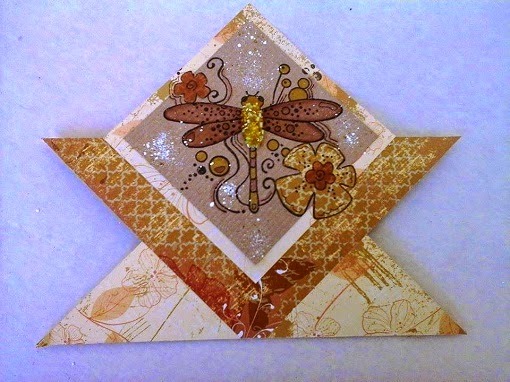 To create something a little different on the bunting for the middle pennant i added a the brown Kraft tag and "sugar spun" glue effect on top of a different patterned paper. Tie the hemp cord around the top and secure in place with silicone glue. 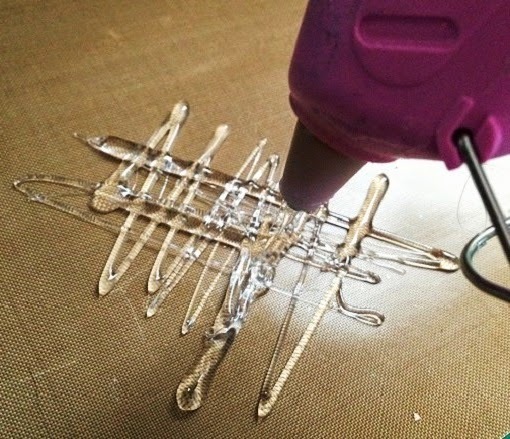 To create the hot glue embellishments you need to work with your hot glue gun directly onto your non stick craft sheet. Creating a blob of glue press the acrylic stamps directly into the hot glue, please be careful when doing this as the glue is extremely hot and can cause burn. When cooled it will turn a cloudy colour and safe to touch. For the middle tag create a "spun sugar effect". Once this has cooled and dry cover with copper leaf, shiny transfer foil, or Dreamweaver powders for your desired effect. 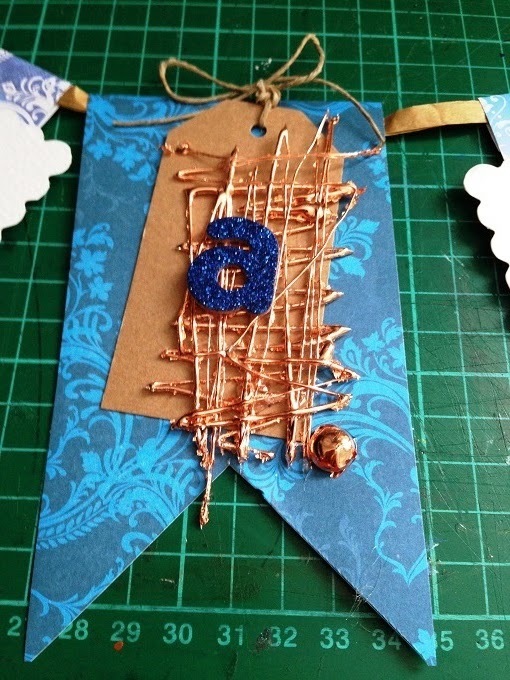 In this project the embellishments were covered with copper leaf. For Stix2 tri-packs of Seed Beed and Glitter add when the glue is wet. Once the tags were decorated I threaded through Raffia through the flaps along the top of the pennants. 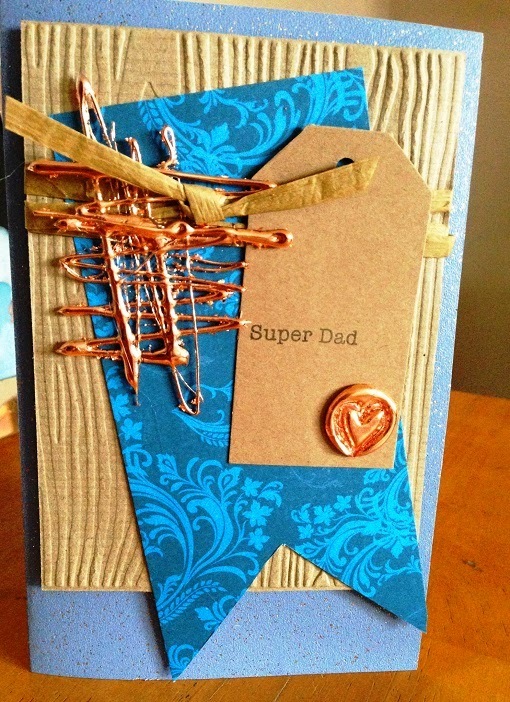 Here is a Father's Day card to Inspire you in the competition. Start by running the kraft card through the embossing folder, to create this fabulous wood grain effect. 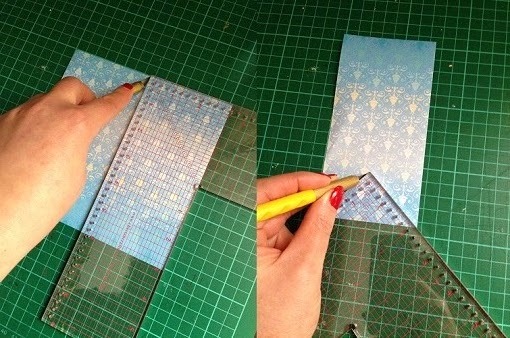 Cut a sheet of 6" x 6" patterned paper in half using the layer perfect, line up on the 3” mark and cut down with a craft knife. 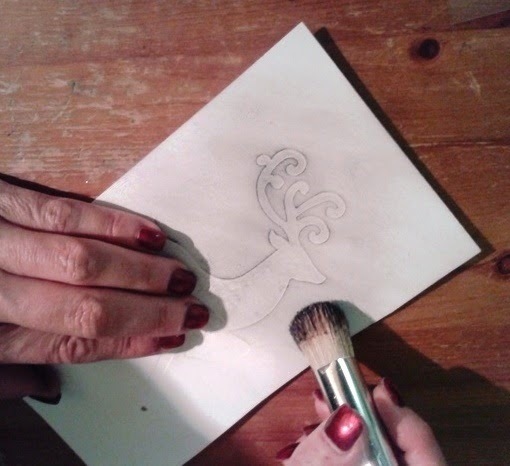 If you do not feel confident with a craft knife draw a pencil line and cut with scissors. Next use your layer perfect to cut the triangle from the bottom end of the strip of paper, ensuring that the layer perfect is the same measurement on each side at the 2" mark. Attach this to the wood grain card with the permanent tape runner. Wrap around Raffia and secure in place with a knot. fold a sheet of A4 stardust card in half to make the card itself. Cut this down to my required size using the Layer Perfect. Then attach the woodgrain card to the stardust card with silicon glue for added dimension. Use the Layer Perfect to ensure you have a perfect border of stardust card around. 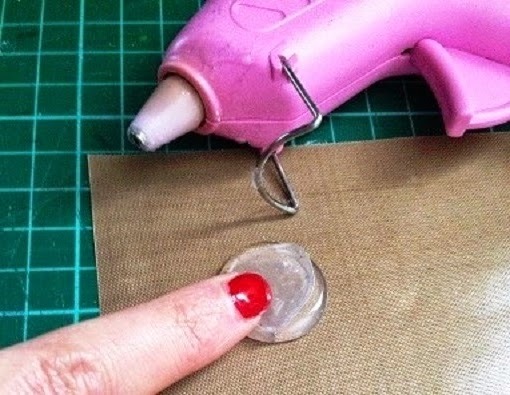 Next create your hot glue embellishments creating a blob of glue directly onto your crafting sheet. Stamp directly into the hot glue using the acrylic block and please be extra careful as the glue is extremely hot, leave to cool. 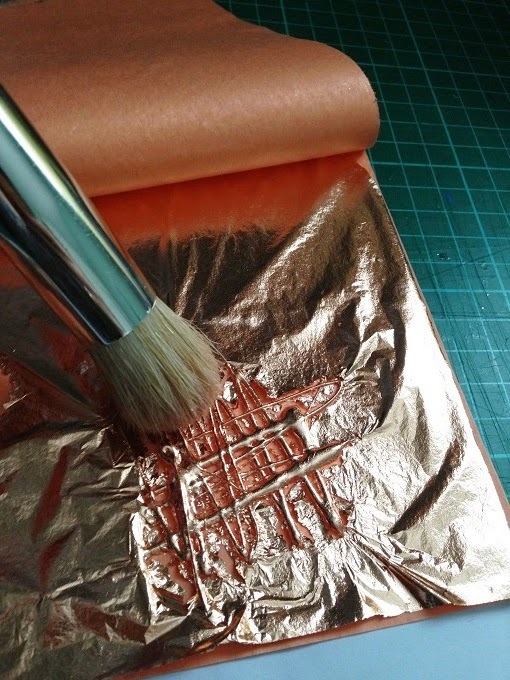 Once this is cooled remove the stamp carefully from the hot glue and add either add Dreamweaver dust, Transfer Foils or Copper Leaf. For this I used the Copper leaf. For Stix2 Seed Bead and Glitter add when the glue is wet. 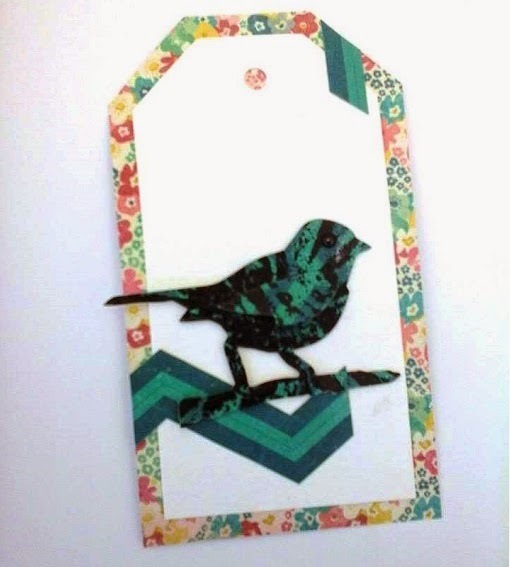 Stamp your chosen sentiment onto the Kraft tag and add this as well as the hot glue embellishments to the card. I secured the hot glue embellishments with small blobs of hot glue as I find that his holds it best. The Craft Barn in Lingfield are holding their summer crafting Extravaganza Saturday AND Sunday. Michelle will have all our exciting Stix2 products including the new Clear Extra Thick Acetate, S57320, and will be showing her fancy techniques for you. Doodleso in Prestatyn have our lovely Kirsty coming along on Saturday to join Emma and show you more interesting things you can do with the Hot Melt Glue Gun, S57234, to use this as more than sticking things together alongside other exciting techniques and projects. 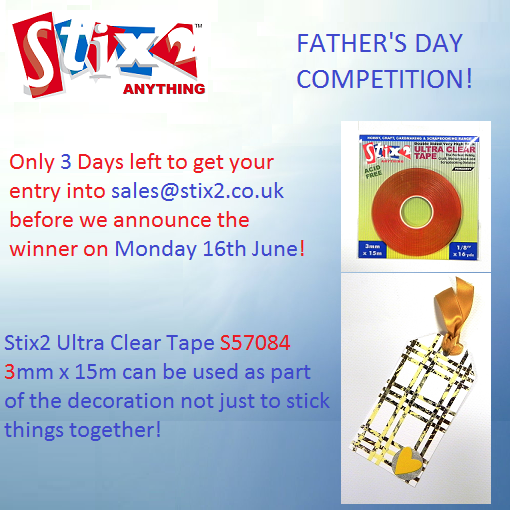 Don't forget to ask the girls about ideas to enter our Fathers Day Competition to WIN £80.00 worth or Stix2 goodies.